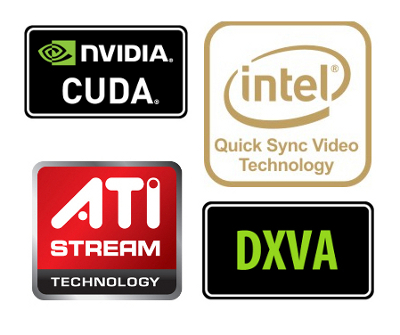 NVIDIA CUDA, ATI AMD FireStream, DXVA, Intel Quick Sync... These words are familiar to those who know what GPU computing means. For the rest of us: all the mentioned technologies are special hardware components, which accelerate video decoding by offloading it from CPU to the Graphics Processing Unit (GPU). These GPU computing technologies make programs on your PC run faster, as well as they extend battery life. Take a look at the infographic below and see the results of the test that we've conducted to find out how drastically GPU technology affects PC battery. Watch 2D video in classic red cyan 3D format using amazing 3D Video Converter! With anaglyph red-cyan 3D glasses on you can enjoy 'converted to 3D' movies in glorious 3D on the device you like: PC, TV, iPod, iPhone and other devices. Download free 3D Video Converter trial to experience 3D vision yourself! Play any regular movie or video in 3D mode on-the-go in powerful 3D Video Player. Try the best 3d video maker yourself - download free trial version of 3D Video Player now! Read Next -> 3D without glasses - the future of 3D technology?